Former CEO of two publicly traded companies and director of five public companies including Adams-Millis, a NYSE company for 19-years. He was named Entrepreneur of the Year by North Carolina’s Council of Entrepreneurial Development (CED) in 1995 and is the author of four published business books. Mr. Johnston is a former CEO of two publicly traded companies: Digital Recorders from January, 1990 to December, 1999 and IDTek from January, 2001 to December, 2006. 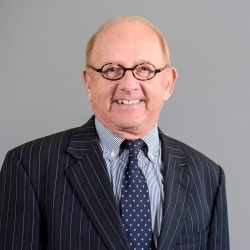 He has been a director of five public companies: Adams-Millis (NYSE) from February, 1982 to March, 2000; DRI (NASDAQ); Southern Film Extruders (NASDAQ); IDTek (OTC); and Marion Manufacturing Company (OTC), Phil brings substantial leadership experience to the Koolbridge Solar team. Phil also founded NCTA, the largest technology trade association in NC and authored 4 business books, one of which Esquire Magazine described as “the best book ever written on small business”. In 1995, Phil was named Entrepreneur of the Year by the Council of Entrepreneurial Development.